One of the best ways people choose to spend their holiday weekends is on the beach — especially in sunny San Diego. With Memorial Day, the Fourth of July, and Labor Day coming up, families and friends will flock to the coast to celebrate their long weekends. 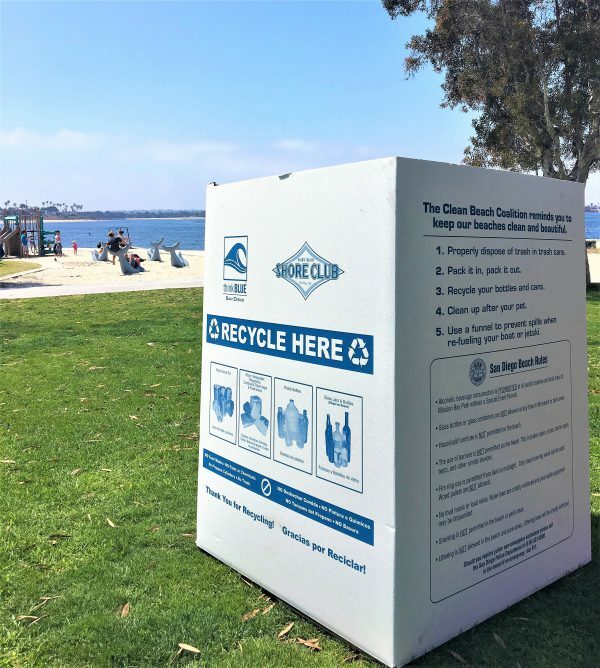 In response to the influx of locals and tourists, ILACSD and the San Diego Clean Beach Coalition (SDCBC) will place 200 temporary trash and recycling bins along some of the city’s busiest beaches to reduce the amount of beach and marine litter. A Clean Beach Coalition recycling bins set out for the Fourth of July last summer! Over the past decade, SDCBC has kept 3.5 million pounds of trash off the beach and out of the ocean. This past year, over 61,000 pounds of debris were collected during the summer holiday weekends. 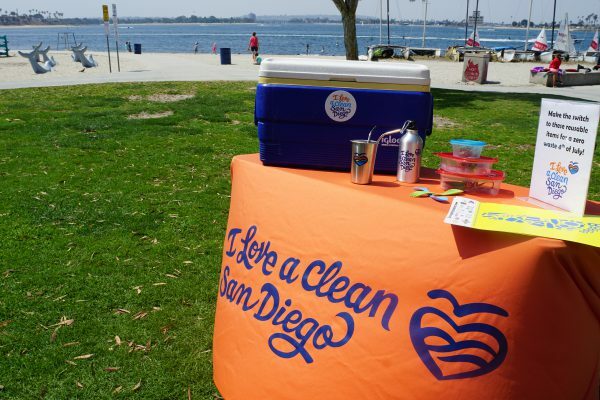 With the support of Think Blue San Diego, PB Shore Club, FreePB, and more, SDCBC aims to educate beachgoers about the benefits of swapping reusable alternatives for single-use products. How can you make the most out of your holiday weekends while staying sustainable? SDCBC recommends that visitors bring hard plastic coolers, refillable water bottles, and food storage containers to reduce the amount of disposables items brought to the beach. Avoid bringing plastic straws and utensils! And make sure all recyclables are clean, dry, and empty. Spend less time worrying about your waste by visiting our zero waste database, WasteFreeSD.org, for everything you need to know about reusable options! Summer can stay sustainable by simply packing reusable options when preparing to head to the beach! In fact, your only worry while basking in the sun at the beach should be when to reapply sunscreen. That is why SDCBC’s goal is to ensure that the safety of the community and the ecosystem is not compromised by the impact of litter. With these easily accessible CBC bins, visitors are able to responsibly throw away and recycle their waste while still enjoying their vacations. Even at the most crowded beaches, people will still be able to enjoy the sun, sand, and the ocean in San Diego! Not planning to hit the beach for the holidays? No worries! You can still party with a purpose while you celebrate this summer! A picture is all it takes to support ILACSD as the local Keep America Beautiful affiliate. With Absolut Vodka’s new Absolut America campaign, for every photo submitted through the site, $1 will be donated to Keep America Beautiful or another selected charity. After submitting your photo, you can share the decked out picture on social media to show how easy it is to support ILACSD and Keep America Beautiful all summer while you #PartyWithAPurpose with #AbsolutAmerica. 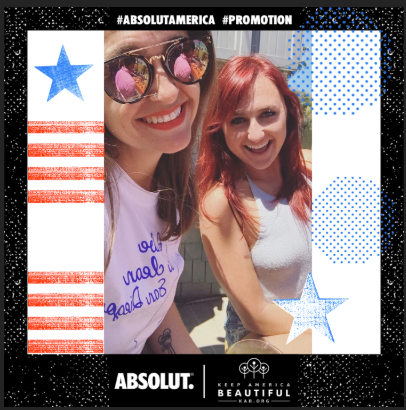 Support Keep America Beautiful and its affiliates by submitting a photo of how you party with a purpose to Absolut America! With the Clean Beach Coalition and Absolut America, it is simple to #DoBeautifulThings. Just by recognizing the impact that waste has on water ecosystems, San Diegans are better prepared to act wisely when it comes to waste, especially during the summer holidays. For more information about the Clean Beach Coalition, make sure to visit CleanBeachCoalition.org.